Temporary redness of the skin can be caused by contact with irritants such as harsh chemicals found in cleaning solutions, excessive dryness due to too much showering or cold weather and illness that induce fever or rash. Contact dermatitis is the name of the skin problem that occurs when something irritates the skin enough to make it itch, sting, erupt in tiny bumps and swell slightly. Soaps, latex products, dyes and solvents are all common culprits behind a contact dermatitis condition. Everyone has experienced some kind of rash that, although temporary, can cause intense itching and mild pain for a minimum of several hours up to several days, depending on the cause of the rash. Rashes are scaly, red patches of skin that emerge from a variety of conditions ranging from areas of skin remaining too hot and moist with relief to contact with toxic plants like poison ivy or sumac. Atopic dermatitis, or eczema, is epidermal inflammation arising from a combination of environmental and possibly genetic factors, Eczema is characterized by a bright or deep red coloring of the affected area along with swelling, dryness, blistering, itching and bleeding when scratched. Treatment for eczema consists of applying topical corticosteroid cream to the affected skin or, in severe cases, injecting corticosteroids into the blood. Cheek redness that is accompanied by minor swelling, itching and small, pimple-like papules may be attributed to rosacea, a fairly common, chronic skin condition that can be treated successfully with intense pulsed light therapy. Although rosacea primarily affects the cheeks, it can also develop in the forehead and around the nose, depending on the severity of the condition. Rosacea outbreaks are often triggered by stress, sunlight, drinking alcoholic beverages, certain medications and even eating spicy foods in some individuals. IPL therapy helps reduce the redness and inflammation of rosacea by inducing collagen production and eradicating tiny capillaries that are the main cause of rosacea. Telangiectasia are dilated blood vessel that you can see lying underneath the skin. They can occur anywhere on the body and are visible as small to medium-sized reddish or purplish areas that resemble spider webs (hence the term “spider veins”). Generally harmless, telangiectasia conditions are usually the result of excessive sun exposure, aging, pregnancy and alcohol drinking. Doctors think there is a genetic component associated with telangiectasia as well. Improving the appearance of telangiectasia that affects the face, legs and other body areas that are readily visible is accomplished with sclerotherapy, a treatment that involves injecting a substance into the damaged veins that causes them to shrink and disappear. Red spots on the skin that feel rough, have a scaly appearance and rise slightly above your normal skin may be areas of actinic keratosis, a skin condition that is directly caused by excessive exposure to UV radiation. Older individuals who spent a lot of time in the sun when younger frequently develop actinic keratosis, which can be treated in a number of ways that include electric cautery, cryotherapy, chemical peels or photodynamic laser therapy. Occasionally, actinic keratosis that are not treated turn into squamous cell carcinoma, a type of skin cancer that will needsmore aggressive treatment. Purplish-red or “cherry” red spots on the skin may be cherry angiomas, a benign skin condition that usually affects people over 40 years old. Medically deemed vascular lesions, cherry angiomas are comprised of dilated capillaries lying just under the surface of the skin that have clustered together to initially form a tiny red spot. Eventually, the spot grows in size and becomes a spongy, soft, dome-shaped area that may be a 1/4 to a 1/2 inch across. Harmless and painless, cherry angiomas may bleed when bumped or injured and more commonly found on the legs, arms, face, neck and scalp. 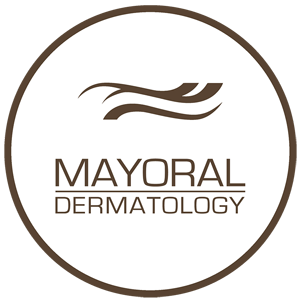 Treatment for the removal of cherry angiomas include cryotherapy, electrosurgery or laser therapy. Pulse dye laser therapy is especially effective for reducing the appearance of cherry angiomas due to the laser’s ability to reach blood vessels where high-intensity light heats and destroys damaged cells responsible for the raised, red skin lesions. In addition, PDL therapy encourages new cell regeneration which helps to rejuvenate the skin’s health and complexion. Some risk factors may make certain individuals prone to conditions causing skin redness. These factors include fluctuating hormone levels due to puberty, pregnancy, menopause or andropause; family history of suffering specific skin conditions; excessive exposure to sunlight or tanning beds; being older than 40 and being fair-skinned. Moreover, any type of skin redness that does not resolve on its own or by using home remedies should be seen by a dermatologist to determine what it is and what kind of treatment is needed to improve the condition.